The St. Albert Tigers are a Senior Men's AAA team comprised of adults aged 19 years of age and older. We are devoted to developing players into skilled and disciplined members within our team framework. Many of our players have or are currently attending colleges/universities in the United States and Canada trying to further their baseball careers. Our team has always been dedicated to providing high caliber baseball on the field. The Tigers compete in the Baseball Alberta Sunburst League during the regular season and playoffs. The Sunburst League is the highest quality of Senior Men's amateur baseball in Alberta and the winner of the league earns the right to represent Alberta at the Baseball Canada Senior Men's National Championships. 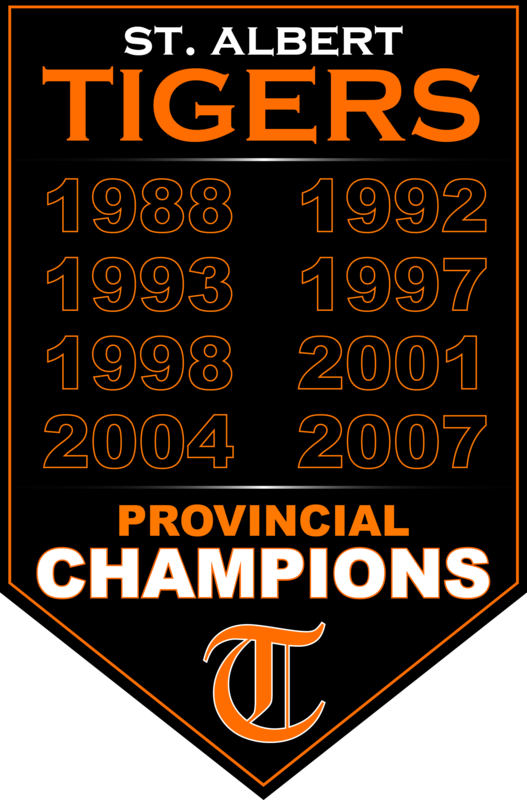 Since being established in 1987, the Tigers have won 8 Provincial Championships with the most recent coming in 2007. Our relentless approach to excellence has lead to the St. Albert Tigers always having a goal of being the best team in Alberta year after year. Along with the 8 Provincial Championships, the Tigers team has also been crowned as the National Champions in 1999 and 2002. The Tigers also have two Silver Medals from the 1994 and 1998 National Championships and a Bronze in 1993, while also competing in the 2005 and 2008 Nationals. The St. Albert Tigers are not only one of the most decorated men's baseball teams in Alberta, but across Canada. With a firm commitment to helping baseball grow within the community of St. Albert, our goal is to continue to make history every year.